Photo credit: Mark Jared Zufelt, Aether Images. After Uncle Vanya and Doktor Glas–two relatively conventional productions–it was both odd and pleasant to see Akropolis Performance Lab get back to their roots. It’s odd in the sense that it’s been five years since I first wrote them to update my database of theater companies in Seattle and was told they were “on artistic hiatus”; I wondered whether they were ever going to make work like the Dream of a Ridiculous Man ever again. It’s pleasant because in returning to their tradition of theatrical inquiry they’ve created a work that makes me think all is not lost in Seattle. Ecce Faustus shows Joseph & Zhenya Lavy and their company taking up the oft-repeated oft-misunderstood maxim from Walter Pater that all art aspires to the condition of music. For while in all other kinds of art it is possible to distinguish the matter from the form, and the understanding can always make this distinction, yet it is the constant effort of art to obliterate it. This is a difficult path to carve in the tradition of the stage. Music still has a unity of matter and form, but particularly in our digital age, the idea that music has a human locus at all–that music is performed by human beings live and in time–has hidden well in the back of people’s minds, if it exists there at all. In music the recorded has replaced the human. It’s often doubtful how or whether people contemplate that music is something other than an ever-present thread in the loom of worldly noise. By contrast the tradition of the stage finds it extremely difficult to abolish the presence of the human body. Indeed most contemporary practitioners and theorists believe this is its power. Since abolishing the body is an intractable problem not even completely solved by Beckett, one seeks other solutions. With the Akropolis group, the solution seems to be merge the body as closely with music and with musical form as possible. This was certainly the case with their version of Jeanne, the Maid, and Ecce Faustus continues this pursuit. Its structural form is twenty-four parts based loosely upon the Requiem Mass. The most obvious reference is to the 24 years of servitude under which Faustus controls Mephistopheles, but too it refers to the final 24 hours of Faustus’ contract–his day of reckoning. In this way, the play compresses and distends time simultaneously. But there is also the musical dimension. 24 is 2 times 12 — namely the twelve tones of the Western musical scale. Ecce Faustus takes its inspiration and prologue from Thomas Mann’s novel, Doktor Faustus, the subtitle of which is The Life of the German Composer Adrian Leverkühn, Told by a Friend. Mann’s choice of a musical composer as protagonist is far from arbitrary. It allows him to connect the Faust legend to the life of Friedrich Nietzsche, whose Birth of Tragedy From the Spirit of Music became one of the most influential books on both drama and music for the 19th and 20th Century. It also allows him to deal with music directly–particularly the twelve-tone music of Arnold Schoenberg. Akropolis have thoughtfully avoided Schoenberg and instead sought the music of Carlo Gesualdo. Gesualdo’s life is certainly closer to the Faust mythos than the rather staid life of Schoenberg. Beyond the implied reference to Gesualdo’s life as Faustian in its own right, the music of Gesualdo shows a fragile tension between the sacred and the profane that also befits a contemporary retelling of the Faustus story. Mr. Lavy has always insisted that this version of the Faustus story would not be “pseudo-ritual theater.” Perhaps not. But it is quasi-ritual theater, in the sense that the structure and imagery of the piece itself suffice as ritual where no ritual can be clearly found. Without question, APL’s work continues a tradition of holy theater in Peter Brook’s sense that’s rather gone missing in Seattle’s theaters. Narcissus dances with Helen of Troy as the angels of evil and death look on. Photo by Mark Jared Zufelt/Aether Images. All rights reserved. The setting is spartan. Four, possibly five stage lights. Four props. No costume changes. No curtain to tell you when the play begins or ends. The staging, too, is spare. A storyteller tells the tale as a confession in a church which is, in fact, for the audience a Presbyterian church (back to Pater’s unity of form and matter again). Once the actors appear they do not leave the space. They are in effect fragments of Faustus, individuated bits of consciousness and conscience that interact with and enact his fantasies. Yet the spareness makes the interactions complex by placing so much emphasis upon the actors. And these actors are nothing if not devout. 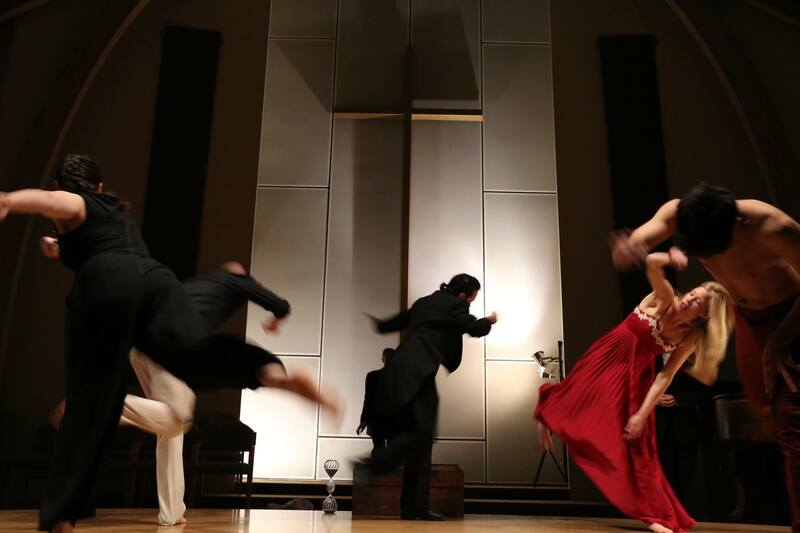 Their commitment to movement is especially remarkable, most notably to me in the pentagrammatic dance in which five actors weave and intertwine their movements to describe Faustus’s conjurations. It’s quite exquisite. On the individual level, I’m normally a big fan of Emily Jo Testa but her level here is much higher than I’ve seen from her recently. She often gets cast for her excellent vocal ability. It’s rare she gets to show off her gifts for movement, and her joy here radiates. The sympathy between Tyler J. Polumsky and Annie Paladino as the Bad Angel and Good Angel, too, anchors the performances around them. And I’d like to see Sara Kaus and Matt Sherrill more often. Their gifts are obvious, and their body of local work far too small. The harmony of relations between the performers makes them equally harmonious in the purely musical matters of singing the Gesualdo melodies from his madrigals and Sacrae Cantiones. Zhenya Lavy’s arrangements guide a tightly knit group into a realm in which even professional singers fear to tread, and it is all so natural and effortless within the drama that it is easy to forget how extraordinarily difficult it is. Have a listen to any two or three different recordings of Gesualdo–William Christie’s Les Arts Florissants and the Quintetto Vocale Italiano for instance–and you will see that the music is unruly at best, and that no one approach can be remotely definitive. Despite the group’s obvious starting point from Doktor Faustus: The Life of the German Composer Adrian Leverkühn, Told by a Friend, it wasn’t Thomas Mann I had on my mind during my viewing of Akropolis Performance Lab’s Ecce Faustus, but rather William Golding. Where Mann’s novel is about largely social identity and the conditions that create such a drastic world around Adrian Leverkühn, Golding’s novel is about individual identity–particularly identity in the face of annihilation. Faustus here is far from the Heinrich Faust who, on his way to hell, is taken up last minute by the angels in Goethe’s version of deus ex machina. No, this Faustus is much more like Christopher Martin: vulgar, obsessive, vainglorious, and more than a touch mad. “Be silent, suffer and abstain, of thy ill lot to none complayne” is neither in his character or his soul. Pincher Martin defies God and existence itself, and God, in the form of black lightning, annihilates him without mercy or pity, just as the demons here scatter Faustus to the winds. While he lacks Pincher Martin’s complete absorption in his greed, Faustus does share with him the madness of a rejected reality, creating an intricate, completely detached world that intends to stave off death but fails. In that sense he is analogous to Antonin Artaud–the other obvious influence on the production. The effect of all this is much closer to opera than it is to straight liturgical drama. I’ve heard some people call it a modern mystery play, but it’s a bit more than that. It’s a re-examination of Nietzsche’s response to the Gesamtkunstwerk of Greek tragedy he felt that Wagner had corrupted. For Nietzsche, Wagner’s totality was artificial, overwhelming the audience to make them passive, emotional rather than rational. Undoubtedly the Akropolis Ecce Faustus has the power to overwhelm as well, and distinctly prefers the emotional rather than the rational. But it seeks, I think, to reconcile the emotional approach with an active rather than passive response. Can that even be accomplished? I suspect that answer will vary for each person. But this is a poetic and thoughtful meditation upon the possibilities for a theater that exists at the boundaries: beyond mere recitation of text, beyond merely “natural” movements that accompany dialogue–but not exactly dance, and not exactly chorus either.